When: Sunday, November 17, 2013, 5 p.m. Scouting Report: In the past two seasons, Towson has made a strong push turning themselves around. In the 2011-2012 season they were at the bottom of the totem pole, going 1-31 for the season. Then came last season, a new year for the Tigers to start fresh. They pulled themselves together and finished second in the conference, and had an 18-13 season. However, the comeback season was halted when Towson had issues with academic eligibility and was removed from the CAA tournament. Now the Tigers are a heavy favorite to win the conference this year and have been off to a great start. They are currently 3-0 winning easily against Navy and Morgan State, and against Temple. 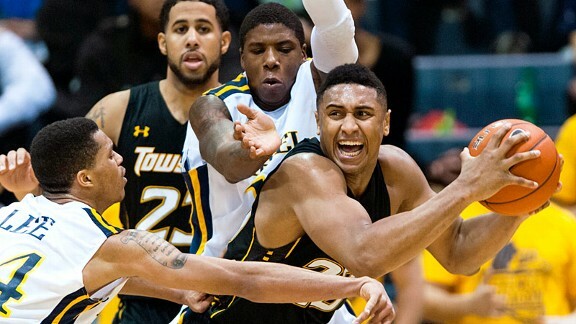 Towson will ride the back of conference player of the year, senior Jerrelle Benimon. There is no doubt that he is their best player. Last season in his first season for the Tigers, Benimon averaged double-double figures for the season. He had an impressive 17.1 points per game and 11.2 rebounds per game. This year, Benimon has been off to a great start and is on pace to put up better figures than he did last season. He has put up at least 20 points in the past two games and is coming off of a 32 point performance against Temple. When he isn’t scoring he is doing whatever he can to contribute on the floor. In the win against Navy, he only had six points; shooting 1 for 8 on the floor. He complemented that performance with game-highs in rebounds (17), assists (4), and blocks (3). Benimon will provide the toughest matchup for the Wildcats so far this season. He is relentless, and will give everything he’s got when he is on the floor. He will be assisted by forward Marcus Damas and Rafriel Guthrie. Damas is a three-year starter who has been improving with each season. He is currently averaging 14.3 points over three games. Guthrie has been the sixth man for the Tigers and has done well in his role off the bench. Although he struggled against Temple, Guthrie shot efficiently and put up 16 and 20 points against Navy and Morgan State, respectively. Sophomore point guard Jerome Hairston is on the rise, and although his numbers may not suggest it, he is doing a good job in his second-year as a starter. Outlook: Benimon is the heart and soul of the team. For Villanova to come out with a win on Sunday, they have to contain Benimon on ALL aspects of the game. Even if he is not scoring, he will not give up and find other ways to contribute. Temple head coach Fran Dunphy said that he is able to play in the NBA. JayVaughn Pinkston and Daniel Ochefu have their work cut out for them. Towson will play a lot of isolation ball, so they have to be ready to take Benimon one-on-one. Coach Wright will most likely have double teams and presses ready for him. This is the first opponent of the season where they have a strong inside game. While the bigger guys anchor the floor, the others have to step up. James Bell, Darrun Hilliard, and Josh Hart, have all been playing well so far for the Wildcats. They need to keep up the good play, and shoot well from outside. The matchup inside is not as favorable for Villanova as it has been in the last few games. Towson will look to beat the Wildcats inside and punish them by converting on turnovers and second chance points. Temple was leading by eight in the second half when they started to turnover the ball to Towson. Ryan Arcidiacono has been off to a quiet start, but don’t count him out yet. He will look to get himself back on track. In the two games the Wildcats played so far this season, we have seen a sharp contrast between them. A cold-shooting Lafayette game, and a no mercy 31 point blowout against Mount St. Mary’s. Villanova has to come out ready to play and prove that the Lafayette game was just a one time thing. I see Villanova winning this one, but the margin of victory will be in the single digits.